Do you want to share your passion for a particular technology or methodology? Can you help other developers, researchers, and managers solve problems and be more productive? Are you searching for a way to network with a larger community? Would you like to raise your profile in your industry and take your career to the next level? If so, you’re invited to apply to speak at an O’Reilly technical conference (or two). Even if you’re new to the speaking circuit, we want to hear from you. We’re actively seeking new voices and off-the-beaten-path topics. Any ideas, best practices, or challenges that you’ve encountered and conquered are fair game. If it’s important to you, chances are it’s important to others as well. 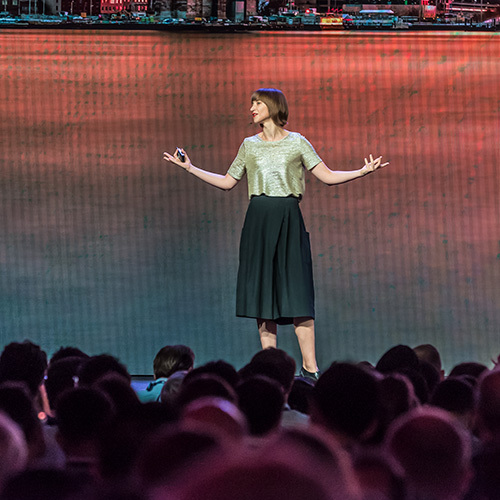 O'Reilly Software Architecture Conference in New York 2020 The call for speakers will be open late June-August 2019. O'Reilly Strata Data Conference in San Jose 2020 The call for speakers will be open late July-September 2019. O'Reilly Artificial Intelligence Conference in New York 2020 The call for speakers will be open late September-October 2019. What will they be able to take away from it? For tutorial proposals: Hardware, installations, materials, and/or downloads attendees will need in advance. A biography and hi-res headshot (minimum 1400 pixels wide) for each speaker. Check out our guidelines​ for capturing a great portrait. Length of presentation: 40–50 minute session or three-hour tutorial. All presentations and supporting materials must be respectful and inclusive and adhere to our Code of Conduct​. Share audience takeaways in your description. Be sure to list the main things attendees will learn from your talk and be able to apply to their work. Be authentic: Your peers need original ideas from real-world scenarios with relevant examples. Limit the scope: You may not be able to cover “Everything about Framework X” in your session time. Instead, pick a useful aspect or a particular technique, or walk through a simple program. Don’t assume that your company’s name buys you credibility. If you’re talking about something important, spell that out in the description. Remember, what’s familiar to you may be new to someone else. While we do want the latest and greatest research and techniques, powerful explanations and stories will appeal to a broad audience. Detail matters: Vague proposals face an uphill climb. Share with us WHO you are, WHY you’re excited about your topics, and WHY we should get excited about seeing you speak. Keep proposals free of marketing, sales, and vendor pitches. Seriously, we can’t stress this enough. Pure vendor sales pitches will be rejected. If you're a vendor, encourage a user of your product to submit a practical talk on your behalf, or submit a technical talk that skips the marketing story in favor of practical and usable information.